Spent a lot time typing on phone/tablet with fingers? 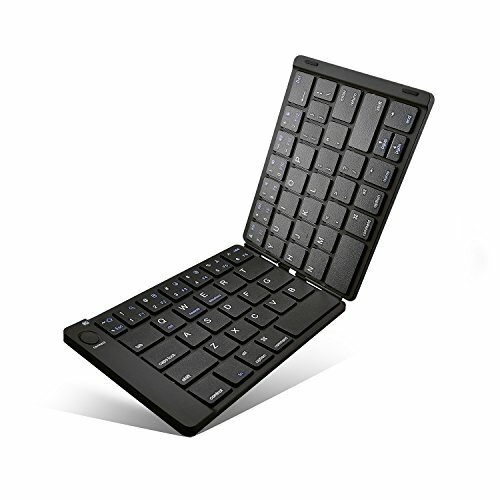 Take this ultra-thin compact keyboard wherever you go, so you can get more done on your tablet or smartphone, no matter where you are. ❤The alphanumeric keys are the same size as regular desktop keyboard, the punctuation and enter keys are just a little narrower, which makes switching back and forth easy. ❤When folded, it's small enough to put in your pocket. And it's so light, perfect take it along with you in your backpack everyday. ❤The amount of key travel is great, the tactile feel is better than most wireless keyboard. ❤On one full charge, the keyboard will work for a long time. ❤Has built in function of auto power off and sleep when folding/unfolding it. ❤Closes gently on the rubber cushions and the magnets do not let it open itself. ❤ It is covered with a pleasant rubberized material (soft PU artificial leather), which is nicely felt in the hands. For Desktop PC Laptop without bluetooth function, you need to use third-party bluetooth adapter (not included). If you found any problem with this keyboard, please charge it firstly. Low power may cause various problem. If the problem cannot be fixed, please send us a mail, we will give you replacement or refund within 1 year. With full-size alphanumeric keys, this keyboard provides fast, accurate typing, feels like those regular standard keyboard you are accustomed to. Foldable, lightweight, compact design, easily fit into a bag or pocket, lets you take it wherever you go so you can get more done on your tablet or smartphone no matter where you are. And, no trouble of pressing any key by mistake when you don't use it. The built-in rechargeable battery provides up to several months of usage on a single charge. Compatible with IOS, Android Windows phone smartphone, tablet, laptop, Apple iPhone, iPad, Mac, etc. If any problem with this keyboard, please charge it firstly. Low power may cause various problem. If the problem persists, please send us a mail, we will reply within 24 hours to resolve it for you. Your satisfaction is guaranteed! If you have any questions about this product by Joyzy, contact us by completing and submitting the form below. If you are looking for a specif part number, please include it with your message.